Bottom Creek Gorge is an exceptional natural area that harbors four rare species and a rare natural community, and boasts spectacular scenery. Two natural features command the landscape here: a pristine mountain stream and a deep gorge framed by slopes of granite and shale. Bottom Creek drains the southeast slope of Poor Mountain to form the headwaters of the south fork of the Roanoke River. 19 fish species – nearly one-tenth of all fishes native to Virginia – populate the clean, rushing waters of Bottom Creek. Three of these species are rare: riverweed darter, orangefin madtom, and bigeye jumprock. The last two fish occur in fewer than 20 streams in the world and are considered critically imperilled. The shale slope forming the north rim of the gorge supports an old-growth stand of Carolina hemlock trees. Splintering shale outcrops above the creek support a rare plant Chestnut Lipfern, whose nearest relative inhabits the arid deserts of the Southwest. The moister south slope is characterized by mixed hardwood stands of oak, hickory, maple, and tulip poplar, with an understory dominated by rhodendron. The forests lining the steep hillsides above Bottom Creek protect water quality by limiting soil erosion and by shading the water, maintaining the cool temperatures favored by native fishes. Elsewhere, forests give way to meadows and ponds, reminders of the farms that once operated here. In addition to its ecological significance, Bottom Creek Gorge is also renowned for its beauty. Its waters cascade over a 200 foot drop known as Bent Mountain Falls before winding through the gorge. This waterfall, best seen from the falls overlook, is the second-highest in Virginia. The Nature Conservatory began planning Bottom Creek Gorge Preserve in 1978 when the Virginia Chapter and forerunner of Virginia’s state Natural Heritage Program reorganized the outstanding variety of fishes found in the creek. Since 1988, the Conservatory has acquired 1,657 acres here. 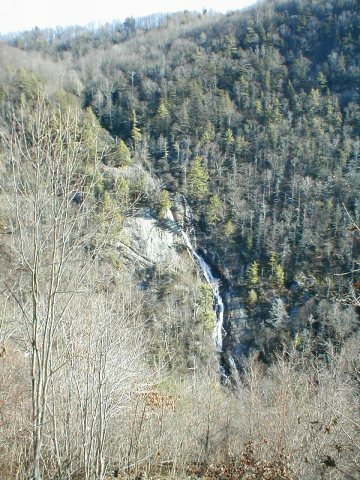 While most of the land has been purchased, the 74-acre tract containing the waterfall itself was donated in 1992 by Appalachian Power Company. The Conservatory and local landowners have jointly protected another 298 acres through voluntary registry agreements. A volunteer stewardship committee lends valued support in managing the preserve. Bottom Creek Gorge was settled in the late 18th century, reaching a peak population of over 20 families in the mid 20th century. Settlers called the gorge “the roughs” because of the rocky, almost impassible terrain. Scattered about the gorge are old house sites, farmsteads, graveyards, stone dwellings built by Civil War deserters, and the remains of an abandoned scout camp, Camp Kiwanniana. The Nature Conservatory is a private non-profit conservation organization show mission is to preserve the plants, animals, and natural communities that represent the diversity of life on earth by protecting the lands and waters they need to survive. Through 1996, the Conservatory with more then 800,000 members has helped protect more than 9.3 million acres in the U.S. and Canada. Continue straight on Route 669 (the road turns to gravel for a while)-DO NOT turn right on Bottom Creek Road. After 1.5 miles, you will come to a "T." Turn right, staying on Route 669. Go south on Route 419 for about eight miles to Route 221 at Cave Spring. 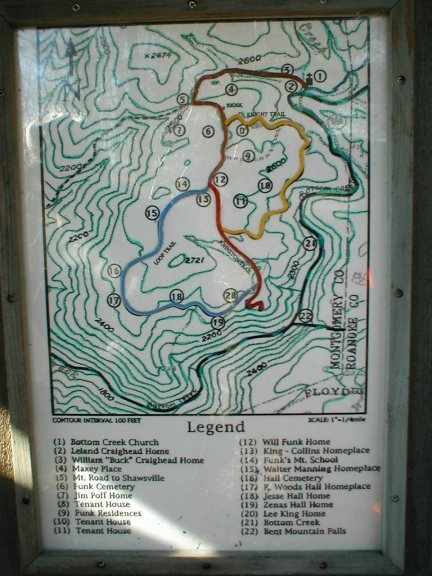 You will pass through the town of Bent Mountain, then pass an entrance to the Blue Ridge Parkway on your left. About 0.6 miles past the Parkway entrance, turn right on Route 644. After 1.1 miles, the road forks. Stay to the right on Route 669.